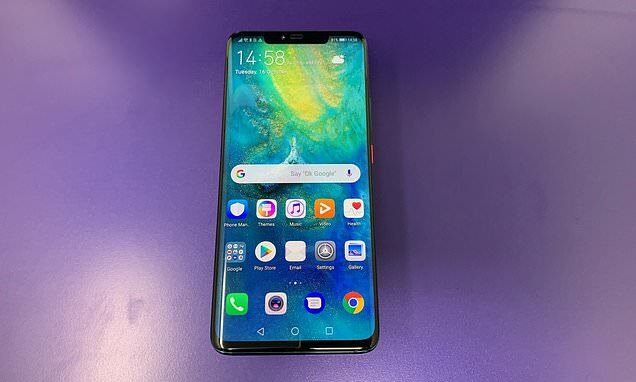 Huawei has unveiled its latest flagship smartphones, which the Chinese firm claims contains the 'most powerful chipset on the market'. The firm unveiled the £700 ($925) Mate 20 , £920 ($1,215) Mate 20 Pro and £790 ($1040) Mate 20 X at a special even in London. The Mate 20 series will initially launch in the UK, France, Italy, and the UAE, with the US expected to follow. All three phones have a triple-rear camera system that includes a 40-megapixel wide angle lens, a 20-megapixel ultra wide angle lens, and an eight-megapixel telephoto lens. Huawei boss Richard Yu claimed the Mate 20 X is also a rival to the Nintendo Switch mobile console as a gaming device – citing the larger screen, better quality display and longer battery life to back up his claim. The Mate 20 Pro can even be used as a wireless charger, with owners of other compatible wireless charging smartphones able to hold their device against the back of the Mate 20 Pro to charge their own battery. Mr Yu said that the new Mate 20 was faster, more powerful and would charge faster than any of its rivals. The Mate 20 series will launch in the United Kingdom, France, Italy, and the United Arab Emirates. The phones also support a range of augmented reality tools – including animated emoji that use facial recognition to come to life – similar to tools available on the iPhone and Samsung's flagship Galaxy devices.